I bought the fabric for this quilt a year ago in February. It was my first attempt at picking out all solids for a quilt. Even with that, you can see a bit, that the grey is a marble and the light blue does have a tiny pattern on it. 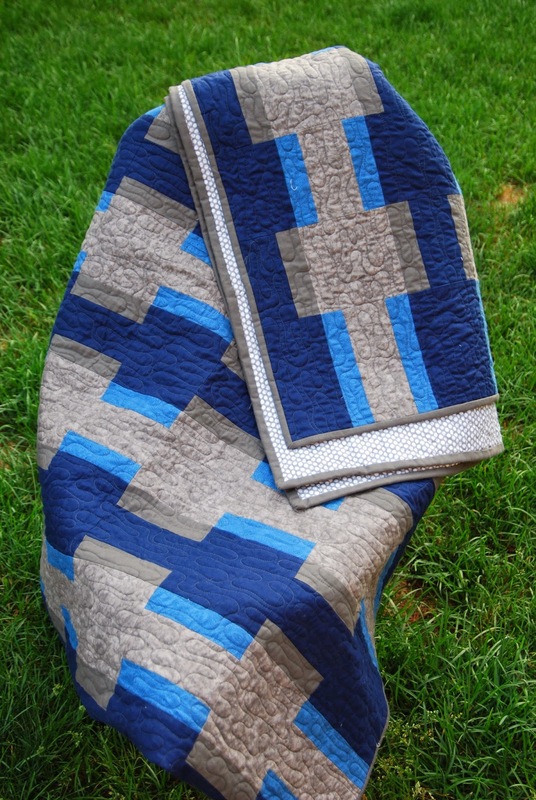 The pattern is called "Loft" from Quilts Made Modern by Weeks Ringle and Bill Kerr. I chose the book because it had a lot of description about colors, and choosing colors, and how your choices effect the final overall look of the pattern. Here it is, mid-July a year later. I absolutely LOVE how it came out. It will be for our guest room and I am looking forward to someone using it! My Aunt Tala did the quilting. It came out AMAZING. One of the goals for the quilt was for it not to look too "girly". I love that the quilting matches the more modern style piecing. Of course, if you look closely, you can see that my rows are not perfectly aligned, but overall, I'm very happy with how the alignment worked. The rows were LONG and a few of them were hard to make line up well. The back I made from two of the bolts that I got when our local JoAnn moved to a new location and had super clearance prices if you took the whole bolt. I only bought six, which I think showed tremendous restraint. Here is a close-up of the two backing fabrics...both dots. I love polka dots. This quilt, although it took me well over a year to finish, has really inspired me to work more with solids. Which do you prefer? Solids or prints?